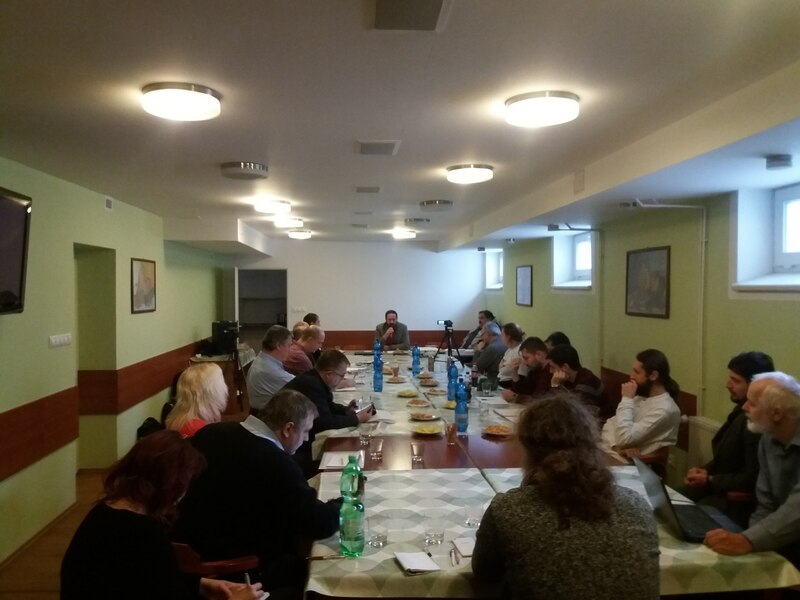 Today, January 26, 2019, we also met in Trenčín at the DAV DVA conference for discuss aboute the current state of civilization. We agree with you at the Davos World Economic Forum that the project of globalization under the dictatorship of liberal „democracy“ fails. You have reminded us Rosa Luxemburg’s words, bruttaly murdered by the alliance of liberals and fascists one hundred years ago: „The bourgeois society stands at a crossroads, either a transition to socialism or a fall into barbarism.“ You have split the scissors of social inequality into monstrous proportions when most of the 700 million people per year, with daily income less than 2 dollars, is suffer from starving. You destroyed and plundered the whole planet for your economic profit. The global financial oligarchy and its collaborating liberal politicians and tenant journalists manipulate public opinion systematically. Potemkin’s villages keep young generation obedient with dubious phrases about equal opportunities, a rational unregulated free market, and the imaginary crimes of Communism, together with totalitarian policing and censorship measures. Young generation is informed tendentiously and educated according to instructions from secret services and propaganda agencies. In the coming crisis, people find out what it means when 26 people have as many as 4 billion people. You try to destroy masses with hunger, thirst and disease. Your 4.0 Industry Project is a neo-Maltese way of eliminating the half of human civilization. You have chosen the way that R. Luxemburg has named as „back into the jungle of the unregulated market,“ the uncontrolled violence, wars, and dictatorships you hold. It’s your way to barbarity. thieves parasitic in nature and civilization. Modern science enables scientists to organize the economy – production and distribution – with the use of information technology and without manipulative advertising. The basis is a fair principle for everyone according to the needs of life and the work done. Everyone must have an unlimited right to adequate education, health and social care, housing and nutrition. To a dignified life! Merit must also be the appreciation of merit in the creation of values ​​and the development of civilization. Excellent workers, professionals, artists and every worker must be able to enjoy high-standard benefits, according to their interest and work results. This is not a return to real socialism coupled with the cold war, nor an unrealizable dream. It is a world in which the parasitic structures of rentier, capital owners, and the company is not wiped out by mortgage interest, advertising and media manipulation, do not needlessly invest in arms, resist armies, and armed robbery in the third sector, the media and public administration. Capabilities of modern IT enable scientific management at all levels of society, instead of lobbyists of political parties of many titles and common liberal doctrines. We want to replace the popularity of billboards, media campaigns and big-party leaders with a people´s democracy, in which the rules of regulation and stimulation of economic development will be laid down by mutual agreement of informed and educated voters. Where the will of citizens will not be a victim of political manipulation but will organize a civilization of dignified living conditions and stimulate any beneficial activity, including scientific research and artistic creation. Next → Kategorické ultimátum nemeckej kancelárky národným štátom: vzdať sa vlastnej suverenity ! Prečo sú naši politici ticho ? Môžeme sa podvoliť ? Časť II. Samozrejme, s väčšinou textu súhlasím. Ale zaujímalo by ma, prečo komunita DAVDVA podporuje liberálny kapitalizmus a podobne prečo podporuje globálny kapitalizmus. Ejha, ale ste tým pracháčom dali! Tuším odchádzali kanálmi…najprv tá mladá Švédka čo im vyčistila žalúdok kvôli zvýšenej teplote Zeme, teraz my…a inak-o čom sa rokovalo? Pekne napísané to najdôležitejšie jednou vetou. Veľmi pekne napísané pán Moravčík. Vízia z Trenčína je šľachetná a kultivovaná, hodná pre ľudstvo 3. tisícročia. Chceš zmeniť svet? Zmeň najskôr seba. -Takže sa staneme napr. vegetariánmi. Nespotrebujeme toľko mäsa a uchránime planétu. -Alebo si nekúpime auto. Použijeme vlaky, autobusy, alebo aj bicykle ak sa dá. – Stanovíme si koľko naozaj potrebujeme pre svoj život peňazí a zvyšné pošleme tým 700 mil hladujúcim..
Treba začať od seba. A inšpirovať najskôr okolie a potom svet. vystoupení nezaujalo dokonce ani německá média. Bylo tam nezajímavo. politika vyčpívá, a že není otázka zda, ale kdy vyčichne. Oni ale hovořili o ideologii, o budoucnosti světového liberalizmu, přitom ne jako o nějakém hospodářském systému, systému nástrojů, stimulace, atd. – ale hovoří o tom jako o ideologii – ekonomické fórum! ideologii, dříve ale maskovanou ekonomií. Ekonomický program ve světě se naprosto rozpadl.